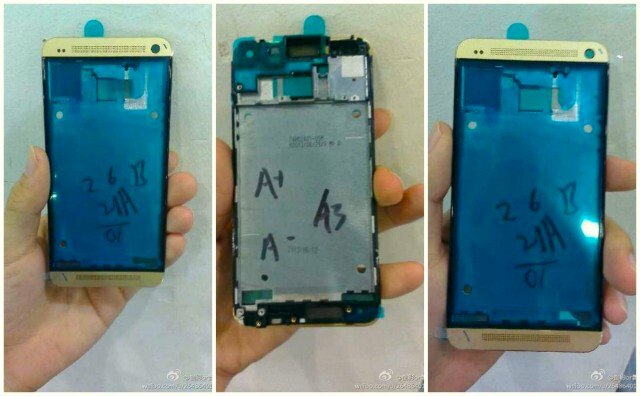 A parts leak coming out of China shows off what could be the newest color option for the HTC One, gold, in a few convincing pictures. Not to be confused with a true gold-plated HTC One, this model looks to just be anodized a different color. At this point, considering that we've seen the One announced officially in silver, black, red and now blue we can't say we're surprised that HTC is working on other anodization options. Now of course people are going to draw parallels to the gold iPhone 5s that Apple just released, and we can't really know for sure how long HTC has been working on this color option or if it is even legitimate. If the parts turn out to be real and actually make their way to regular sales channels, we think the gold offering may be a nice addition to the increasingly colorful HTC One lineup at this point in its life cycle.